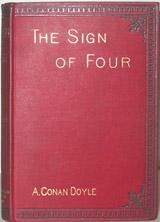 The Sign of Four, was written for the Lippincott’s Magazine by Sir Arthur Conan Doyle in 1890. This was the second Sherlock Holmes novel. The story collects a colorful group of people together, among them Jonathan Small who has a wooden leg and a dwarf from Tonga islands.